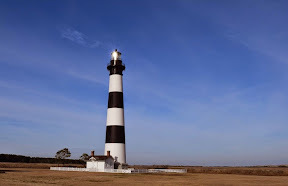 Friday was a glorious sunshiny day so we headed back to the Outer Banks to see some Southern Lighthouses. The Atlantic Ocean off of the Outer Banks was once known as the Graveyard of the Atlantic due to the numerous shipwrecks that happened along its shores. It is estimated that more than 3000 ships are lurking in the depths of the ocean in this 100 mile stretch of coastline. There are 5 lights located here and it was our intention to see them all. 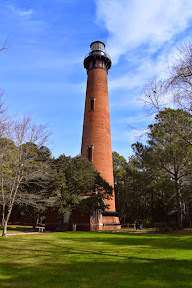 Our first destination was the town of Corolla and the Currituck Beach Lighthouse. It's distinctive red color and black iron work make it easy to identify since all of the other lights in the outer banks are black and white. This lighthouse is 162 feet tall and has 220 steps to get to the top. Corolla is well developed and more easily visible to sailors than it was in 1875 but Currituck still serves as an aide to navigation in the northern outer banks. It's light, flashing in 20 second intervals, can be seen for 18 nautical miles. Currituck is closed to climbing in the winter months but we enjoyed walking around the grounds and admiring the Victorian architecture of the principle keepers house and the outbuildings that once served as housing for assistant keepers. Next stop Roanoke Island. So much history here. We enjoyed walking around the waterfront park and had a great lunch at a local sandwich shop. The Roanoke Marshes light is a small treasure that is located right on the waterfront in Manteo. 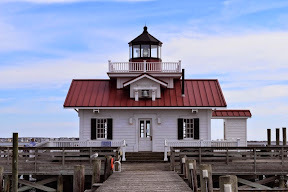 There is a boardwalk that connects it to the pier and although the lighthouse was closed we were able to walk out to it and enjoy the views of Roanoke Sound from its location. This lighthouse is a full scale exact replica of the 1831 original that was lost in the sound due to a devastating combination of sinking marshes, erosion and shipworms. We left Roanoke Island and headed south into the Cape Hatteras National Seashore to visit our third lighthouse of the day. Bodie Island light station (pronounced like body) is just south of Nags Head. It is a distinctive combination of three white and two black horizontal stripes. It is 156 feet tall and has 214 steps to the top. The light can be seen from 19 miles away and rotates once every 27.5 seconds. 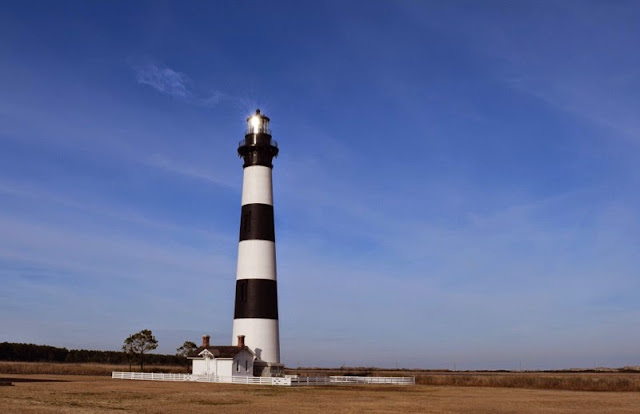 The current Bodie Island light is the 3rd to service its area of coastline. The first was commissioned in 1847 but was abandoned after just a few years due to structural defects in its foundation proved too costly to repair. A second light commissioned in 1858 was destroyed by soldiers of the Confederate Army. The Bodie Island Lighthouse keepers cottage has been repurposed as a ranger station and Outer Banks Visitors Center. We would have liked to see Cape Hatteras and Ocracoke Island this trip but spent too much time exploring Roanoke Island and pondering the fate of the lost colony.